USA Basketball will welcome members of its Men’s Developmental National Team to Colorado Springs, Colo. for a mini-camp on Oct. 5 and 6. In total, 35 members of the 2013-14 USA Developmental National Team (DNT) are expected to attend. LNH saw the majority of these players at last year’s mini-camp and throughout the past year. We can attest to the high talent level of this group. They will be training in part to prepare for the 2014 FIBA U17 World Championship in Dubai. In addition, 13 older kids (born prior to January 1, 1997) from the high school class of 2014 will attend the camp. Some of this older group may earn the opportunity to compete for the 2014 USA U18 National Team and the 2014 USA Nike Hoop Summit Team. Late Night Hoops was in attendance for the October 2012 USA Basketball Developmental National Team mini-camp and today, USA Basketball named 21 of those players and two others to the 2013-14 USA Basketball Men’s Developmental National Team. These young men are among the nation’s top 16-and-under basketball players. As discussed in USA Basketball’s press release, the 23 players will train May 30 – June 7 back in Colorado Springs, Colo. The final 12-player USA U16 National Team will be selected from those 23 and will then depart for Uruguay and the FIBA Americas U16 Championship which is being held from June 11-15. The 23 players include 11 from the class of 2015 and 12 from 2016. The list of players is included below. Two of the well-deserving players with Minnesota ties include Amir Coffey (Hopkins HS / Minnesota Pump N Run) and Henry Ellenson (Rice Lake HS / Minnesota Pump N Run). Milwaukee standout Diamond Stone joins Ellenson from the state of Wisconsin. Congratulations to all these young men – it’s a tremendous opportunity that they have each earned. Seventh Woods (Hammond School / Columbia, S.C.). Earlier this month, LateNightHoops.com attended the USA Basketball Men’s Development National Team mini-camp at the U.S. Olympic Training Center in Colorado Springs, Colo. There, 44 of the country’s top players from the 2015 and 2016 high school classes were on hand to be introduced to USA Basketball and to be evaluated by the staff, who was led by head coach Don Showalter (Iowa City HS/Iowa City, IA). Coach Showalter has led the USA Developmental National Team to four straight gold medals as head coach from 2009-2012. If you have questions or comments, including inquiries about other players that attended the camp but are not included in this article, please send us a message via our Contact Us page. You may hear Ellenson called a center by some, but that’s selling him short. Physically he looks the part and he can certainly battle on the blocks, but his skill and athletic ability sets him far apart from other kids his size. Henry is an excellent shooter with plenty of range well past the three-point line, but has also worked on developing his game on the blocks. Over the next few years he should be able to continue adding to his arsenal of offensive weapons, which is a scary thought for teams trying to defend him. His strength and quickness are not areas of concern, but there is opportunity for him to be elite if these areas progress nicely over the next few years. In college, there is no reason Ellenson can’t be a 3/4 switchable type who can score at multiple levels and defend multiple positions. Now, at this point in time you wouldn’t have him dribbling the ball all the way up the court on a 3-on-1 fast break, but there’s not a lot I’d give him a red light on doing. At a minimum, he’s a very good college prospect. With hard work, I can see Henry winding up as a top 10 player in the 2015 class. Other potential factors such as good coaches, supportive family and older brothers who also play basketball (the oldest brother, Wally, is a freshman at Minnesota and will be able to share his D1 experience and Henry’s father played college ball for Marquette and Wisconsin) all seem to favor the likelihood of success for Henry Ellenson. He’s legit and the sky is the limit. The first thing that stands out about Amir is his length and how well he uses it. With the ball, he’s able to create passing lanes and make plays that others can’t. On defense, his instincts combined with long arms result in frequent steals and deflections. He’s a good scorer, but with more consistency and aggressiveness he could become excellent. Coffey can play off the ball or at point and his ball handling, passing and feel for the game is especially propitious considering he’ll likely wind up standing a solid 6’7”. I’m very high on the future prospects for Amir and can see him at the college level as a versatile wing and distinguished defender. Similar to Ellenson, Coffey’s family (father Richard played for the Gophers and his older sisters are excellent basketball players) and other factors should help him along the way. With Amir now being just a freshman at Minnesota high school basketball powerhouse Hopkins and there being a special class of 2014 in Minnesota, it may be a little while before the masses recognize how good Coffey can be. Nonetheless, we here at LNH are sold and look forward to watching his progression over the next several years. Stone can be as good as he wants to be. The big man controls space inside, but it’s his hands and seemingly delicate touch when shooting that are most impressive. Elite prospect. Likeable demeanor and court presence, he’s going to be a lot of fun to watch. Great voice too – post-playing career as an on-air talent awaits Mr. Stone. Guys I Want With Me in a Brawl – Horace Spencer (State: PA/Height: 6’8”/Weight: 210/Class: 2015) and Andrew Fleming (TN/6’4”/185/2015). Spencer had me worried about his safety – unquestionably willing to sacrifice his body to make a big play. It often looks as if his life depends on denying the opposition’s shot. He’s absolutely a full tilt player with good length. Offensively he’ll clean up the glass and put it back, but has a lot of room for improvement with the ball. However, Spencer’s ability to run the floor, block shots and rebound, as well as his borderline-crazy effort earns his game a ton of respect. Coming off the bench for M33M this summer, we saw Andrew Fleming at several tournaments across the country providing a spark for his team. Sometimes it was relentless defense or a hustle play to save a ball heading out of bounds. Other times it was a deep three or an aggressive drive the bucket where he was able to absorb contact and finish. Fleming is a good shooter, big time worker and fearless. In Colorado, we saw more of the same – tireless effort from a very competitive kid. Giles is no longer a slim, wiry young kid. It appears he’ll be able to add a lot of strength by the time he reaches college. Very athletic, runs the floor well and is everywhere on the court. Would think it may be difficult to get him out of ACC country, but schools should sure try. He’s excellent at this point, but I believe he’ll be ridiculously good in a few years. I’m sold. Monk was not a guy I was there to see, but his play dictated that I had to watch him. Time and time again he impressed when finishing at the rim, pulling up for jumpers and passing. His athleticism really stood out on certain plays – had several “woah, he just did that?” moments. Strong all-around player who made smart decisions throughout the weekend. I think he projects more as a 2/3, but I really liked what he did when making decisions with the ball in his hand. Will be interesting to see if he continues to hold an edge in court IQ as time goes on, but right now looks like a guy who you’d want as your team captain. Tough, strong and smart kid. 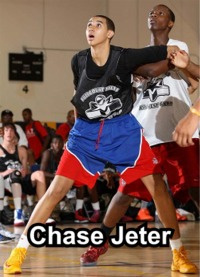 Charles Matthews (IL/6’4”170/2015) – Matthews is 6’4” and a long combo guard who looked great scoring off the dribble. Worked with the point guards at USA basketball mini-camp and has the potential to be a dangerous point guard. May wind up as a wing, but if he becomes a good defender and continues developing his lead guard skills, he could be spectacular. Lots of possibilities for Matthews. Simeon’s “next up” include D.J. Williams (IL/6’7”/186/2015) and Benjamin Coupet (IL/6’6”/180/2016). Both are long wings that can run and score in transition. Two to keep a close on eye. Ivan Rabb (CA/6’8”/191/2015) is legit. Super active and a ton of fun to watch. It’s also obvious he’s having a lot of fun while on the court. Could wind up in conversation of top 5 in his class. The camp’s youngest player Seventh Woods (SC/6’1”/168/2016) is unquestionably a superior athlete. Explosive. Has work to do if he’s going to play point in college, but at a minimum he’ll be one of the most athletic players in his class regardless of position. Head-shaking highlight-maker. Eric Davis (MI/6’3”/161/2015) played a lot of point guard over the weekend, but he’s a combo guard that is always looking to score. His shot wasn’t consistently dropping this weekend, but he showed no fear in taking the ball to the rim against an impressive collection of lengthy wings and big men who were there to challenge him on defense. Quite animated and competitive. Lots of Big Ten interest. Josh Jackson (MI/6’6”/175/2016) passes the eye test with his length and athleticism. Sunday morning during a four-on-four fastbreak/transition drill he fired up the entire gym with an impressive two-way display. First on offense, he drove the lane and slammed home a contested dunk. Quickly, his team had to turn their attention to defense. Jackson turned on the jets for a sprint down the length of the floor and leaped high off the ground to block a dunk attempt from behind, drawing cheers from all of the players and setting the tone for the session.Not sold on his jumper, but he was effective slashing to the bucket this weekend. 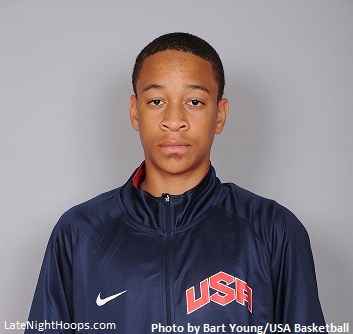 Length and quickness allows him to come up with blocks, steals and boards in bunches. Loads of realizable potential; future impact Big Ten player?